Formulation of Annual Plans and Five Year Plans. Preparation of Plan and Budget Link, Plan Supplement, etc. Monitoring and review of the implementation of Plan Schemes. Coordination in the matter of planning and development in the State. Overseeing the execution of plan schemes. 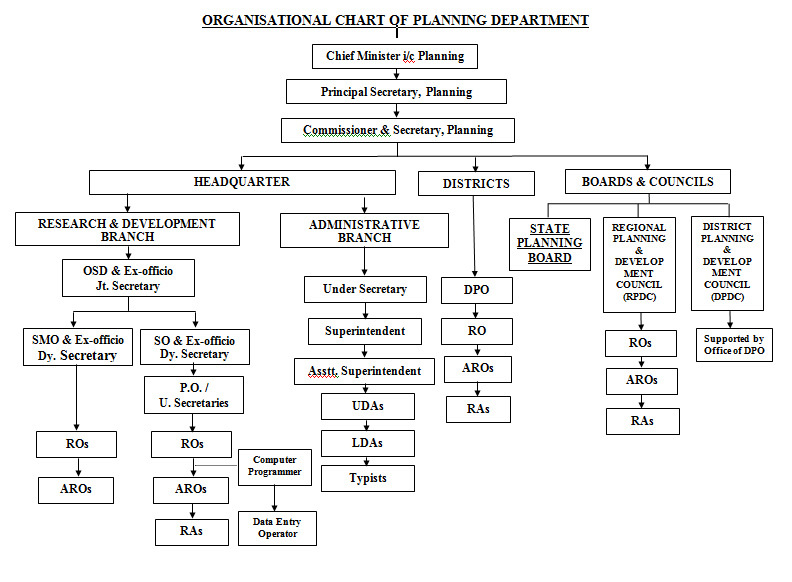 Liaison with Planning Commission and other authorities in connection with development planning. Coordination and overseeing the implementation of regional plans of the North Eastern Council in the State. Coordination and overseeing the implementation of the New 20—Point Programme. Collection and analysis of statistical data relating to plan programme. Formulation of guidelines in the matter of district level planning. All matters relating to the National Development Council. Matters relating to establishment of Planning Machinery at Headquarter and in the District. All matters relating to setting up of State Planning Board and District Planning and Development Council. Servicing Department of the State Planning Board. Administrative Department of the Directorate of Economics, Statistics and Evaluation. Nodal Department for Science and Technology. Nodal Department for Pilot Project for village development. Nodal Department for "Development of One Hundred Villages".